A stylish tyre designed to perfom. With ultra low profile editions and huge rim sizes available, the P Zero Nero is truely a great looking tyre and perfect complement to any high perfomance vehicle. However, don't let the looks fool you, the Nero packs a whole load of punch when it's tests, with superb grip and braking perfomance in both the wet and the dry thanks to the Asymmetric tread design perfected by Pirelli. With large shoulders and deep wide tread grooves adding to the look, they also add to the precision handling that you can expect from the P Zero Nero. 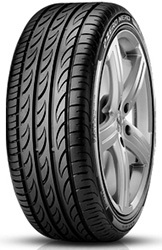 A great option for those sporty high perfomance vehicles looking to maintain class with their tyres. Scoring original equipments on a whole range of high end vehicles from the likes of BMW and Jaguar to Alfa Romeo.